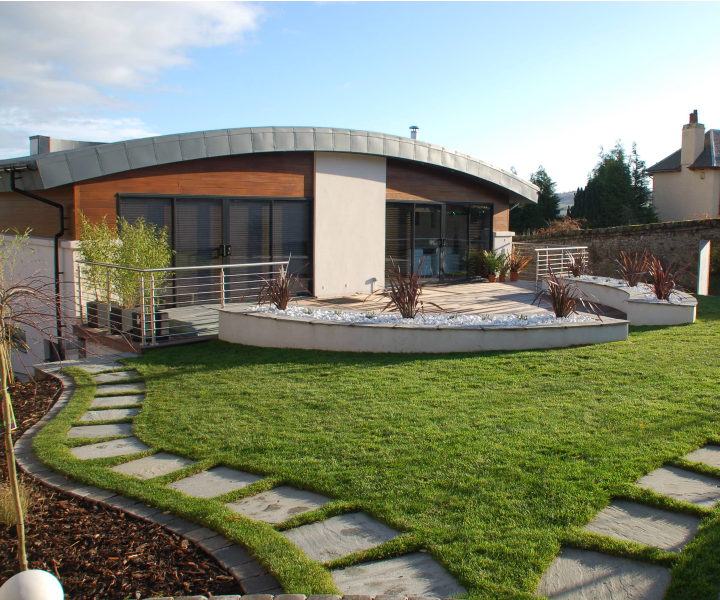 We were commissioned to design and build a contemporary, low maintenance garden space to compliment the beautifully designed property. 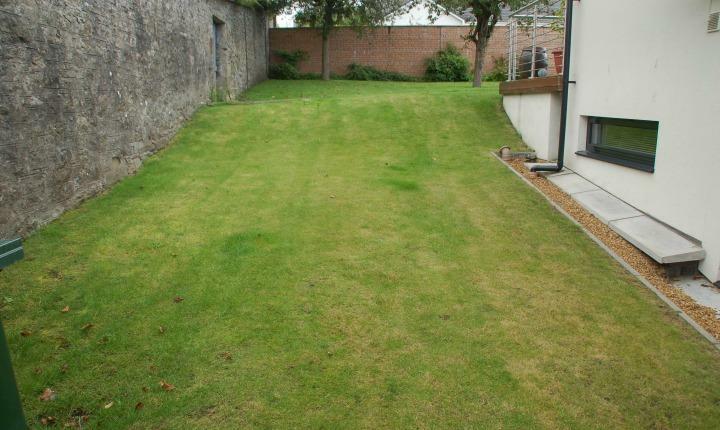 The existing garden was laid in turf at the rear and sides of the property. 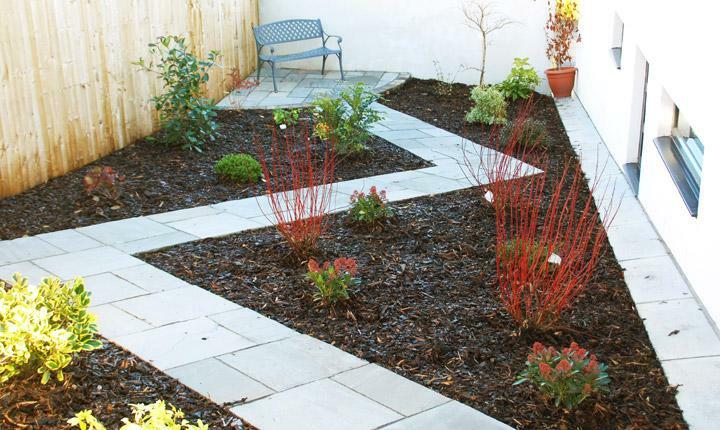 After consultation with the client it was agreed to produce a design to introduce various components throughout the garden, connecting each area via paths. 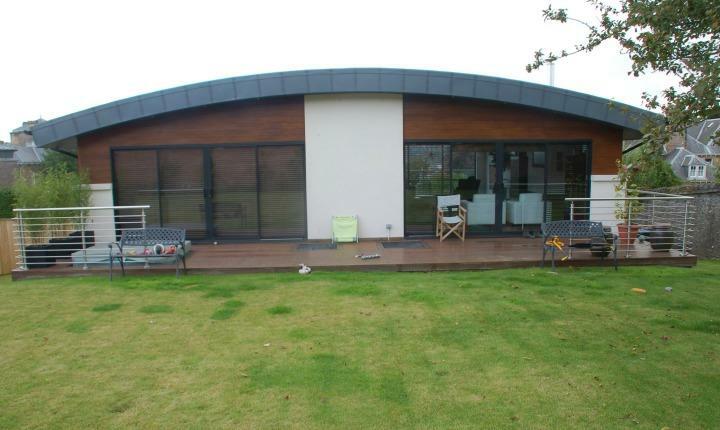 It was agreed to extend the existing hard wood deck at the large rear doors to the property and to construct raised planters which were to be designed to mirror the shape of the property, creating soft curves and a stunning focal point. The rendered planters were constructed, infilled with large bright white pebbles and planted with cordylines providing shape and structure along with lavender to contrast with colour and scent. 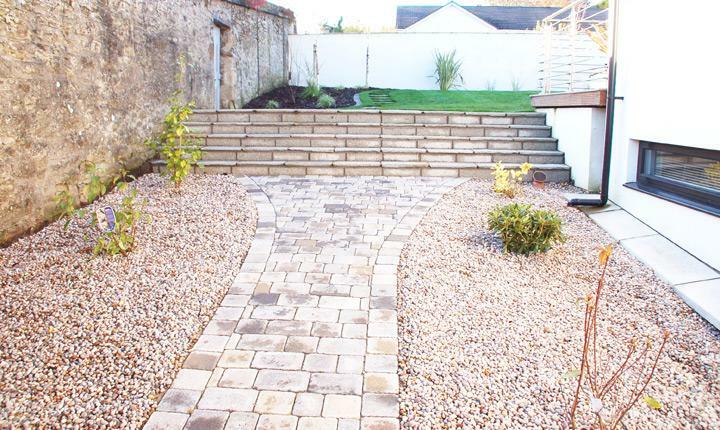 At one side of the property we constructed a set of steps providing access from the front of the property – the wide steps were designed to provide impact and borders created with soft planting. Three borders were formed around the boundary with a flowing stepping stone path connecting each area of the garden, also leading to a small seating area at the rear of the garden. 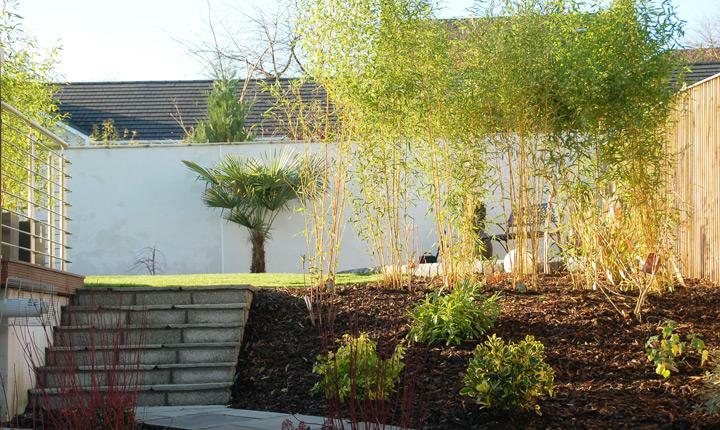 Bamboo were planted to create a screen to the other side of the property where a zig zag path was formed leading to a secluded seating area to escape from a busy day. 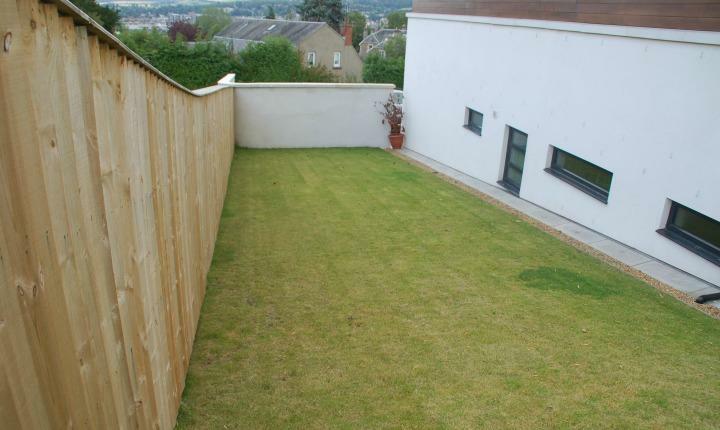 This area was narrow however the design of the path gave the feeling of space. 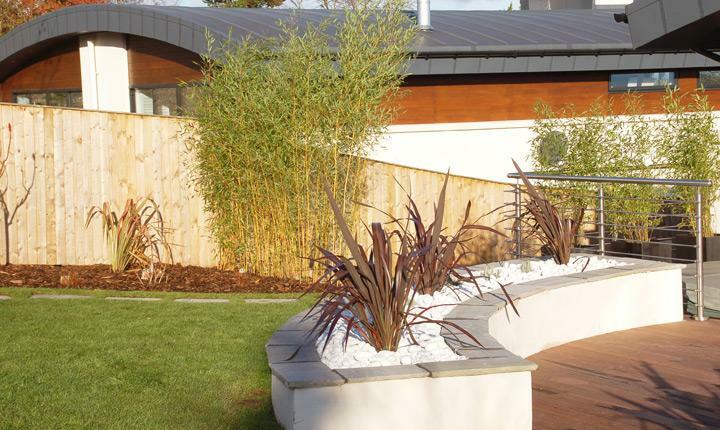 We completed the project with a variety of plants and shrubs which included a mix of grasses, cordylines, Japanese azaleas and maples, adding the finishing touches to a truly magnificent garden. 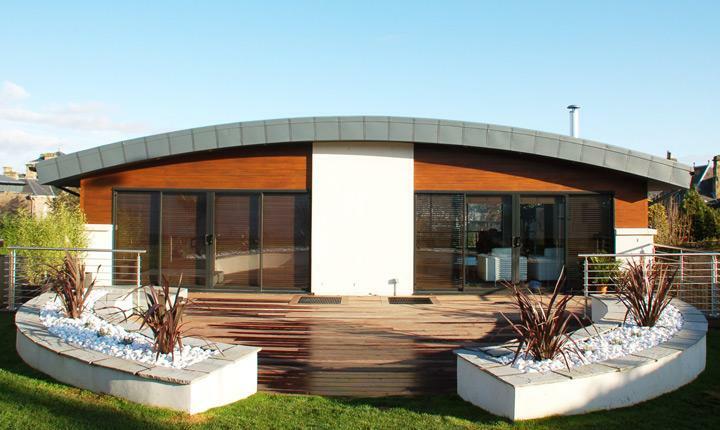 The completed project really complimented the property with the eye catching curved planters mirroring the shape of the property. There were various places around the garden to simply escape or join together and these were connected by a mix of sandstone and stepping stone paths. Planting provided the final touches adding colour and texture to the garden.